If you’re impatient, you can get to the print and play rules and cards of I, I, I, II, III, otherwise continue reading how it came to be. Last Thursday and Friday I ran a student and mentor game jam for all three years of the Games Design course at London College of Communication (@LCCLondon). We had six mentors in from outside the university to help the student teams. In the final three hours of the game jam a conversation broke out between myself, one of the mentors Aubrey (@HilariousCow) and a student Andrew (@over1000inrhyme), who had been abandoned by the rest of his team. We were discussing the smallest board game possible. It just so happened that the nearest counter was an othello piece (black on one side, white on the other) which opened some interesting properties about flipping the counter and changing states. Moving away from our single counter starting point we stacked two of the pieces on top of each other, and considered the different possible operations to perform on the stack. 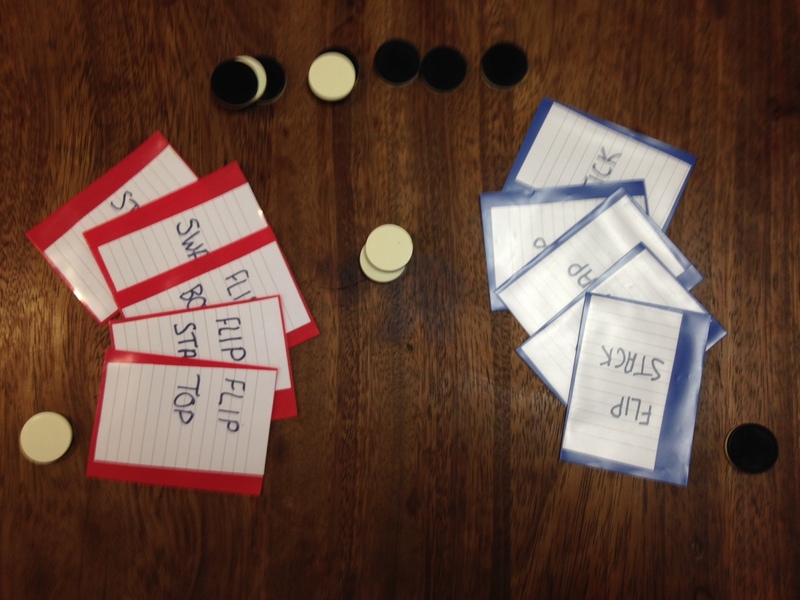 Five cards were made for each of two players both having, flip top, flip bottom, flip stack, stick and swap, and the game started to take form. Cards were played simultaneously face down, and then resolved in order, determined by the colour on top of the stack and the colour assigned to each of the players. The player that colour matches the top colour of the stack was rewarded a point. The first few games were played with cards been returned to the hand and attempting to reach a score of five first. This did not feel quite right, then it became clear that the cards should not return to the hand and they should remain face down so there was an element of memory to the game. This final point scheme was the one we played with during the open gaming event and it seemed to feel right and this became our game title I, I, I, II, III. Aubrey and I have spend the last day trying to formalise and write up the rules in a coherent manner in order that we could share this with everyone. This entry was posted in Uncategorized on February 28, 2015 by davidpeterking.